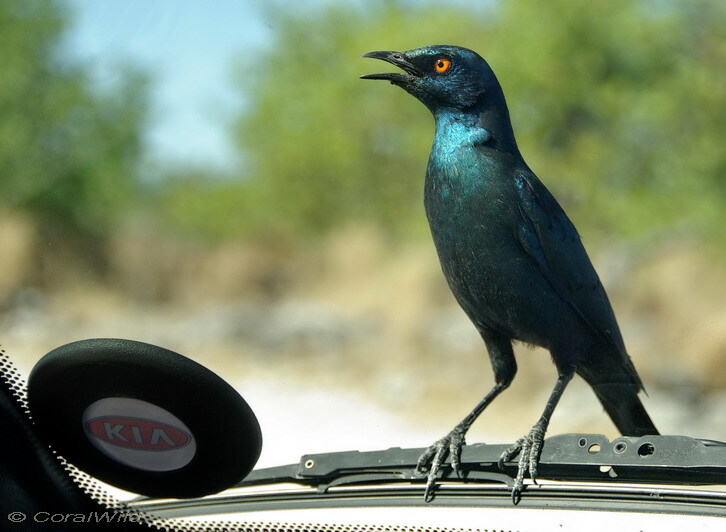 It's “low” season at the moment, just as well with the floods in Kruger having been a little disruptive recently. 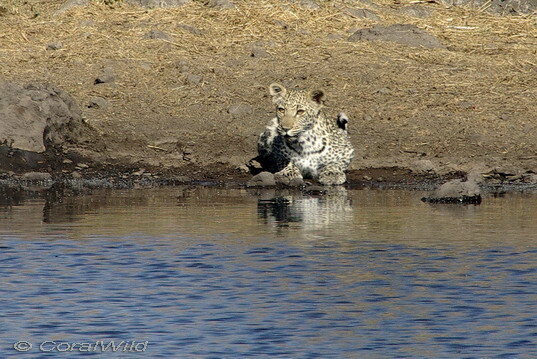 No holidays for most people right now, which equals no safari work for me. As for this posting, I thought I would share with you a rather special late afternoon I had at an Etosha waterhole back in November. 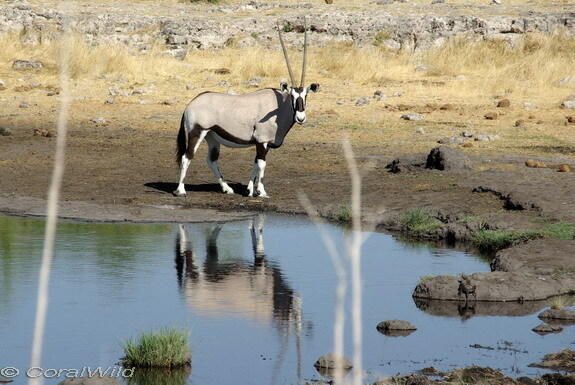 3.55pm I pull into the parking area overlooking the waterhole, no other cars, and gemsbok (oryx) are down there next to the water, yippee! 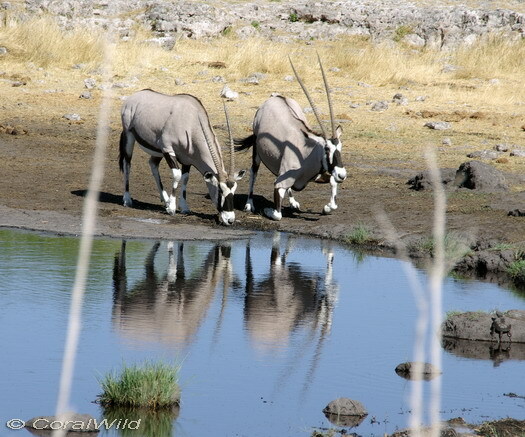 4.00pm The gemsbok appear to be a little nervous, leery, so after a last drink at the waters edge, they move up the bank and exit stage left. 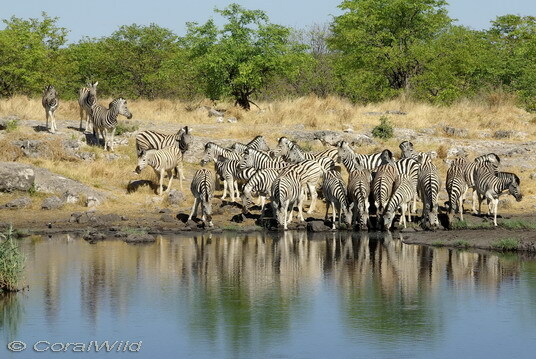 4.07pm All's quiet around the waterhole, except for a few birds foraging in the dried mud and taking occasional sips of water. A brazen Cape Glossy Starling perches on my windscreen wiper, plays “traffic cop” and inspects my licence disc. 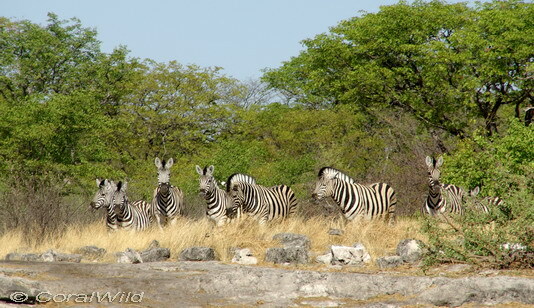 4.14pm Just as a few black/white striped heads appear around bushes across the waterhole stage right, a couple of rental 4x4 vehicles with “ignorant” tourists pull up in the area behind me. Loud voices, car doors slamming, total disregard for others, ignorance of the risk to themselves, the disturbance goes on for a long 4 minutes. 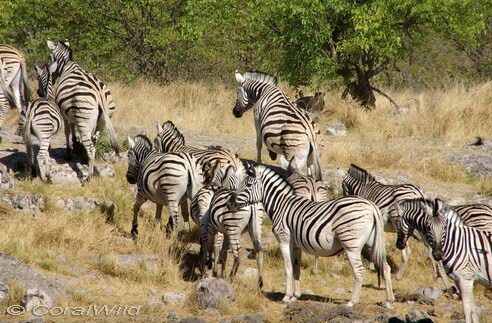 The zebra watch, ears pricked, they are thirsty but skittish, much more wise to potential danger than these oblivious humans. 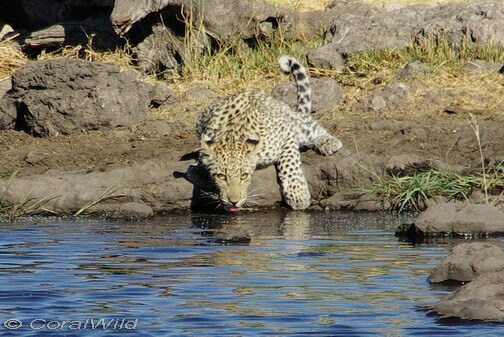 Then they start walking on past the waterhole and I'm cursing under my breath! I am not sure if those people ever had a good look at the water hole, but they depart at last, in a skid of stones and flurry of dust – their misfortune !! 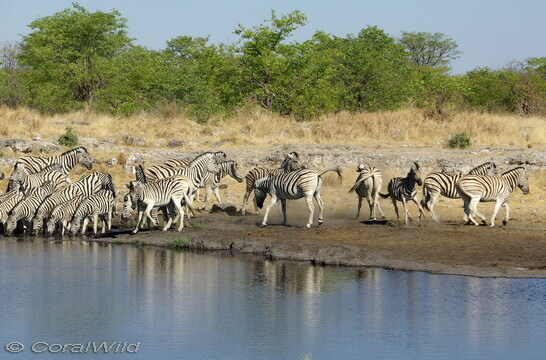 4.18pm Fortunately, the zebra, 30 to 40 of them, now start making their careful way down to the waters edge. Always some are looking out as others take their turns to slake their thirst. 4.19 – 4.28pm Something is in the air though. The slightest movement, a bird taking off, a whisper of wind in the grass, and the whole herd reacts in a flash. I am totally absorbed behind my camera trying to capture the swirling eddies of black and white, rippling reflections and the bucking, prancing youngsters on the right. I have no time to look for any possible source of the animals jitters. I am just making the most of this wonderful photo opportunity. 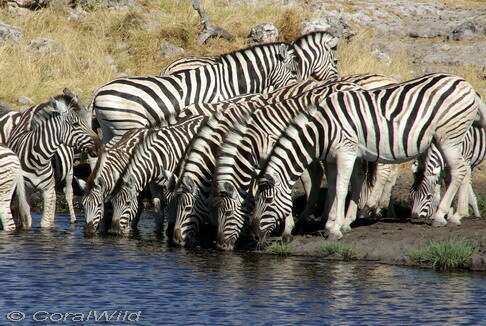 4.29pm Thirst quenched, the zebra start moving up the bank to exit, stage left, the waterhole arena. 4.37pm A flicker of movement in the corner of my eye snaps me back into the present. 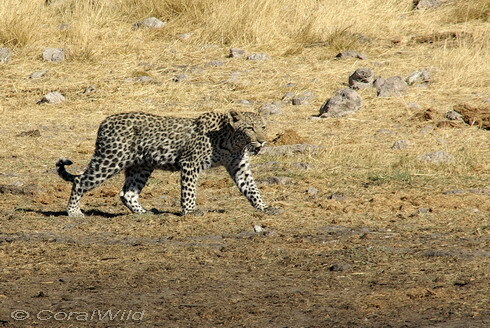 A leopard is walking down to water's edge! It has already walked across 20 metres of open ground before I wake up to it's presence! 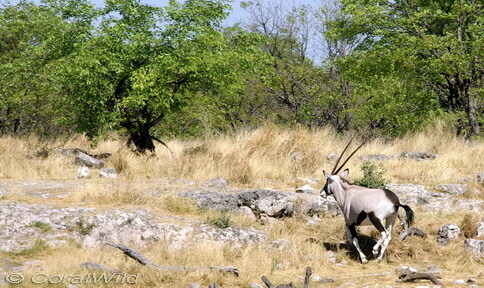 Immediately I understand why the gemsbok and zebra were so nervous. This is the predator they must have been scenting. 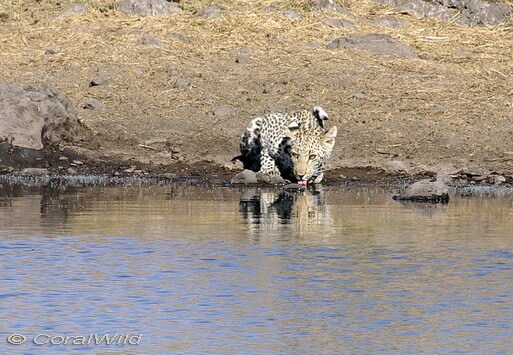 This graceful, young cat is also thirsty on this baking hot afternoon and has waited for all the larger animals to leave before coming down to drink. 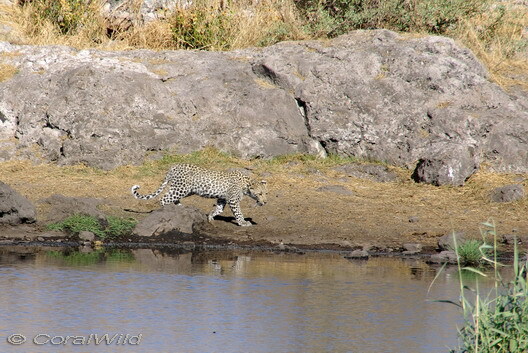 4.40pm Just a few tongue laps of water, some cautious glances across the waterhole, and the youngster climbs over the rocks into a shadowed crevice out of sight. 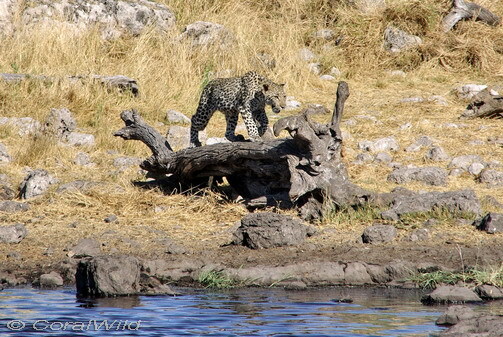 Some playful poses on the dead tree, a photographers dream - even though it's a little too far away for my lens. 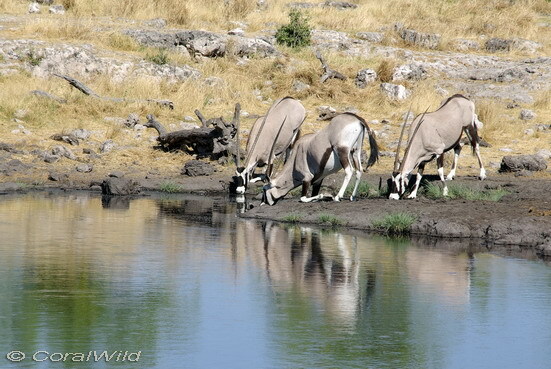 This time having a drink exactly where the gemsbok and zebra first drank. 4.50pm Casually strolling across to the right, up the bank, and disappearing into the long grass. 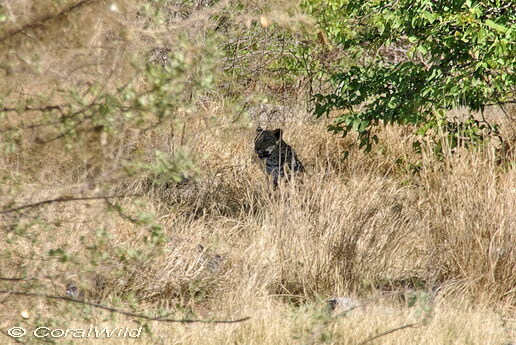 4.54pm I think to myself “well that was definitely the last I'm going to see of that beautiful large cat”, but no, after careful scanning through my binoculars I spot it's head silhouetted against the grass, under the shade of a large Mopani bush. Too far for my camera, but I take a shot anyway. 4.55pm Then up it gets and vanishes deeper into the bushes. 10 minutes later my friends arrive. 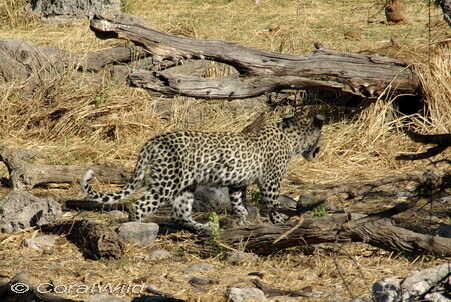 Almost three months later whilst selecting and editing the photos for this post, I spot where the leopard had been for the first 40 minutes before it showed itself out in the open. 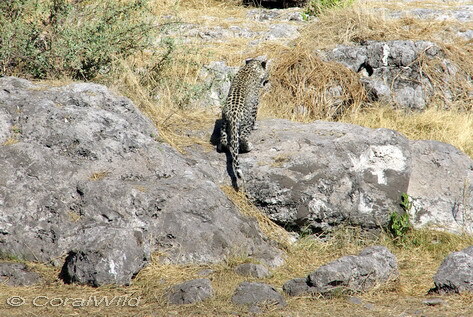 None of the animals coming down to drink saw that leopard either! nice observation, great spot on the photo, Sue ! I don't know which is best - they're all wonderful. Zebras always look photogenic - and you seemed so close to the wary drinking leopard. Time to get a longer lens - think what you could do with it in your situation!! Makes my mouth water. OMG. These are stunning photos and wonderful commentary. Have you thought about publishing your work (perhaps you already do)? It is so beautiful. Thanks Dirk. It would be nice to see and read more about your adventures? Hi Caroline, thanks for the feedback - when does one ever have "enough" lens? I invested in a super zoom (18-250mm) this last year & that will have to do me for a while. It's a great lens for the type of photography I do - on the go, snap shot style. But of course there are always situations it's not going to be good for!